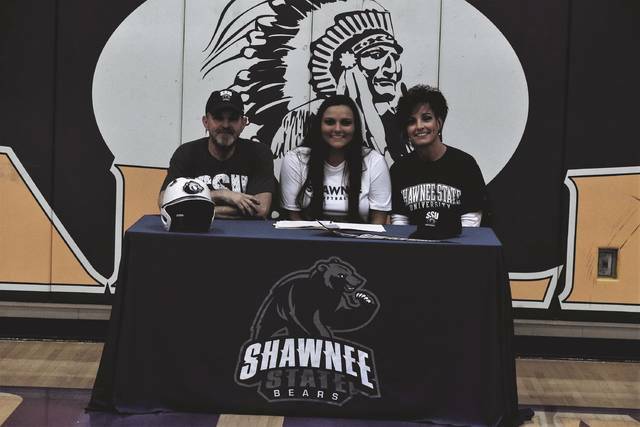 Valley’s Margaret Caldwell signed with Shawnee State University on Thursday afternoon along with fellow teammate Faith Brown in a signing ceremony held at Valley High School. Valley’s Faith Brown signed with Shawnee State University on Thursday afternoon along with fellow teammate Margaret Caldwell in a signing ceremony held at Valley High School. LUCASVILLE — Signing to play with a teammate to play at the same school? But signing to play with a teammate, at the same school, and join another teammate who already signed to that same school earlier in the school year? That’s certainly rare. Valley High School senior softball standouts Margaret Caldwell and Faith Brown did just that on Thursday afternoon when Caldwell and Brown joined their fellow teammate in Marissa Markins by signing with the Shawnee State University softball program in a joint signing ceremony with family members and friends of the two players present at the school. For both Caldwell and Brown, the ability to play the sport that they love — and to do so within a close proximity to home — is an opportunity that both players aren’t taking for granted. However, it’s an opportunity that veteran head coach Montie Spriggs knows is a well-deserved one that both players can handle. Both players, who are All-SOC caliber talents, have continued to prove nothing but the same in 2018. Caldwell, who serves as Valley’s leadoff hitter, holds a batting average of .367, while Brown, who bats in the cleanup spot, holds a .451 average. The latter’s mark is especially impressive considering that Brown, who. like Caldwell, is a three-year starter and has started as the team’s primary pitcher over each of the last three years, has pitched in not only every game and every inning over the last two seasons, but has thrown every pitch for the unit over the last two years, as well. 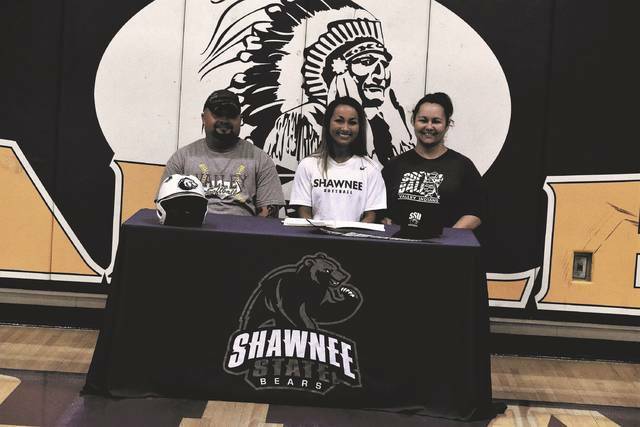 Both of them, however, weren’t sure that playing collegiate softball would even be much of an option, especially Caldwell, who said that her main goal was simply trying to work to get better at the game of softball itself. However, according to both players, the unwavering support that their families, friends, and teammates provided always helped the duo push through. Brown even credited the relentlessness of her own teammates as a reason for her latest softball opportunity. However, it also certainly helps the performance of a player when that player’s school of choice is behind the player in question. And that’s something that both players say they haven’t had to worry about much, if at all. At Shawnee State, both student-athletes will be taking on challenging disciplines in addition to their softball load. Brown is going to major in pre-medicine, where she will look to become an anestheiologist, while Caldwell is leaning toward going into occupational therapy. However, both players know that the support for their careers — both on and off of the softball field — will always be there, no matter what happens.